Twylla’s mother is the Sin Eater and Twylla trained her entire childhood to take over for her mother. But a chance encounter with the Queen revealed Twylla to be Daunen embodied a Goddess who can consume poison and not be killed. A Goddess who can kill anyone with just a touch. The world building was my favorite aspect of The Sin Eater’s Daughter. The world is well thought out and has a Game of Thrones, medieval-esque vibe. I really enjoyed the history of the realm. I wish that this part of the story had been expanded. Alas, the main focus of the story was on Twylla and the cringe-worthy romance that surrounded her. Initially I was fine with Twylla. I thought she needed more of a backbone but being taken to the palace at a young age, and struggling with the fact that her skin could kill someone, I gave her the benefit of the doubt. This might have been okay but as the story progressed Twylla never got any better. She looked to everyone else to defend her and she became almost unbearable to read about. My other issue with The Sin Easter’s Daughter was the romance. Twylla is given a new, extra cute, palace guard and the two of them fall in insta-love. But Twylla is also engaged to Prince Merek and she might just have feelings for him as well *Cue eye roll*. 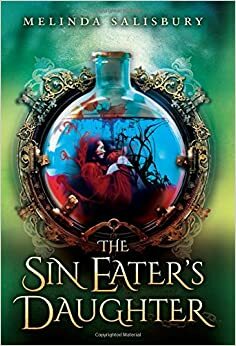 Overall, The Sin Eater’s Daughter started out so strong but Twylla’s lack of backbone, the insta-love love triangle, and the fact that the character’s weren’t fleshed out really took away from the story. I’m seriously on the fence about whether I will read the sequel or not. *Note: This novel totally ends the same way as season 2 of Veronica Mars. Just saying. Haha!! Good catch on the Veronica Mars ending! I pretty much felt the same way about this book. I don't understand why everyone looved Twylla. She wasn't smart or brave and didn't have much of a personality. And she was kind of dumb. She believed everything that anyone told her without even a single question. I'm not going to read the next one no matter how pretty the cover might be. Right?! Twylla never questioned anything she just blindly followed...even at the end she was going to follow Lief, follow the prince, follow whoever was around to lead her. One of my status updates while reading this books was "Twylla is getting on my last nerve" and that pretty much sums up my feelings. I'm finally starting this next week. God, if I didn't buy this, I would not be reading it since I've been seeing a lot of 1-2 star reviews. I'm really glad I got this from the Library. But hey, maybe you will enjoy it, or if you don't you can always trade it on YA Book Exchange. I've never seen Veronica Mars (gasp!) but the love triangle would be enough to make me roll my eyes too.